Earn up to 9,500 reward points. Up to almost 20' high. 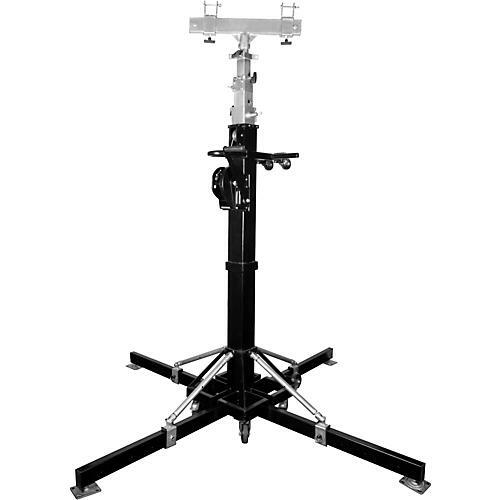 The TRUSST® Crank Tower 6.0 is a crank up tower stand with a maximum height of 6 meters (19.7 ft). It is capable of lifting and supporting up to 250 kg (550 lbs) safely. Constructed almost entirely of metal, there are no plastic parts to break or strip. The Crank Tower 6.0 comes complete with a T-bar adaptor. The T-bar adaptor is adjustable to fit multiple sizes of truss. The rubber coated feet and polyurethane wheels help protect flooring surfaces from scratches. The built in safety locks and integrated winch brake prevent the the load from coming down uncontrollably. Order soon. You can trust your fixtures to TrussT.